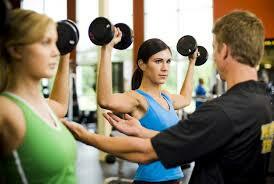 Do you run with a Coach or a Trainer? Football season is upon us. In our house that means I might not be able to engage my husband for a few hours on either Saturday or Sunday, or both. That’s okay. As Rick is watching his beloved Badgers or Packers, I have the freedom to go to one of my favorite places: my workout facility. Coaches abound on the football field. Trainers abound at the gym. Trainers can also be found in-home, online, and even running with their clients. A few years ago I ran the Music City 1/2 Marathon. Along the 13.1 mile route I witnessed trainers running alongside their clients urging them on while offering encouragement for endurance, recovery, and perseverance. This morning I found myself asking the Lord for strength and endurance for a particular situation in my life. I thought of those trainers and then I thought of the football coaches I had watched this weekend. I realized Jesus wants to be more like those trainers I witnessed during the 1/2 marathon than the coaches I saw along the sidelines. Jesus does not want you to walk alone. He wants you to know He is walking alongside you. No matter what you are facing, whether you realize it or not, Jesus is there urging you on. The Lord doesn’t do your work for you. You alone pursue your destiny. You alone choose to live as who you were created to be and to do what you were created to do. You alone walk your walk, do the work, hone your skills. BUT Father, Son, and Holy Spirit are with you every step, every path, every day to bring encouragement and direction. More than the encouragement and direction that human trainer brings, they offer strength and endurance, peace and hope. inspiration and revelation. Right there alongside of you. You never walk alone, but you can choose to put some distance between you and the help that God offers. Many of us give God a coaching role in our lives. Coaches train during practice, they give direction from the sidelines, and encourage and teach their athletes to perform at peak levels. However, they do NOT run alongside their athletes. 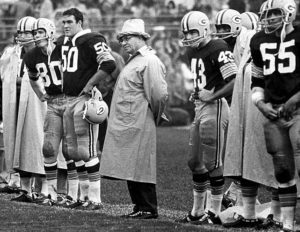 Even the iconic Vince Lombardi did his work from the sidelines. Coaches are not on the field, on the line of scrimmage, making the tackles, or throwing the passes. It causes me to ponder how many times I have relegated my Helper to the sidelines of my life. Even Vince Lombardi stayed on the sidelines. How many times have I said, “Okay Coach, I’ve got this!” or “Now that you’ve taught me what to do, I’ll take it from here.” or “Thanks for the direction and plan, now I’ll implement it on my own.”? My flesh says, “I’ll do this on my own.” Jesus says,” I am with you always.” (Matthew 28:20). My pride says, “I’ll take care of this.” The Lord of Hosts says, “Not by power, not by might, but by My Spirit.” (Zechariah 4:6) God wants to be intimately involved with your life. He wants to run alongside you. He wants to be your trainer. You’ll find He is the best trainer you will ever have. He works all things together for your good (Romans 8:28) as He puts together a work out plan. He has the strength to “spot” you when life seems to be too much to handle. He brings His love, healing, redemption, restoration, inspiration, and so much more to you as He says, “This is the way walk in it” (Isaiah 30:21). Invite Heavenly Father, Jesus your Redeemer, and Holy Spirit your Comforter and Helper to train you. You will cross the finish line of whatever your facing with flying colors if you do. I promise!